Days are shorter, nights are cooler, the sun is lower in the sky, and the rain has washed off the garden so that everything sparkles during the ever-changing November days. While we have no further Gardening Events scheduled for 2018, the garden remains open to the public daily. Come check out our fall colors. Our next workshop will be in mid-January. The 2019 schedule will be posted here by mid-December. Cooler, shorter days are waking the native plants from summer dormancy. 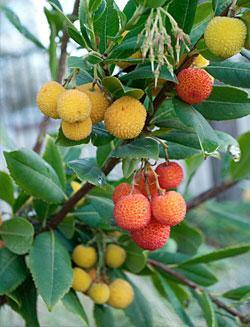 Manzanitas, ceanothus, currants, toyon, and mahonia all are sporting fresh new growth. 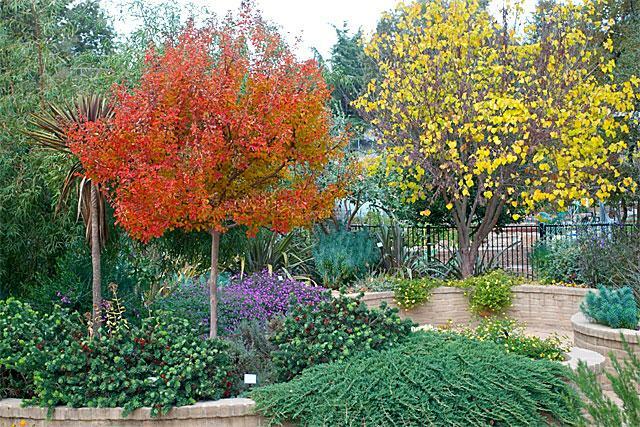 Deciduous plants are bowing into winter with flashy orange and crimson leaves, while the back-lit golden ornamental grass inflorescences wave in cool breezes. Diverse foliage on our evergreen shrubs, grasses, perennials and trees sparkles in the rain-freshened air. Scarlet, crimson, gold and orange leaves on the scarlet oak, Chinese pistache, crape myrtles, Trident Maple, and winged Euonymus alatus (aka Burning Bush) remind us that we are now in November. But, surprising white, yellow, purple and pink accents are everywhere. Late blooming blossoms continue to attract birds, bees and other beneficials. Especially lovely now are the yellow copper canyon daisies and purple, red and blue autumn sages. 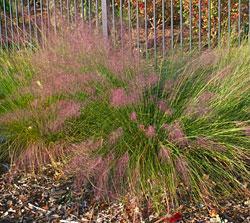 Pink muhlygrass and purple Mexican sages continue to shine in the parking lot beds. 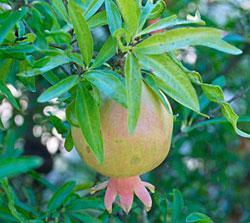 Dwarf pomegranates and the dwarf strawberry tree concurrently display attractive red fruits and blossoms. Red ‘Little John’ bottlebrush along the raised entrance bed contrasts with the white, yellow and lavender lantanas and sages stretching out their blooms to the first frost. In early November, while the earth is still warm, we will plant our newest additions to the garden in order to give young roots a head start on spring and summer. We are wrapping up the installation of our newest garden, an Ultra Water-Efficient landscape that once established in 2 to 3 years will require little summer water. Come check out our progress. We are making some adjustments to the original plan. November is an especially good time to plant bulbs. We have many daffodils, narcissus, brodiaea, and species tulips throughout the garden. Check out our plant lists for details on a few of our favorites. These bulbs are all very drought tolerant as they prefer little or no summer water. Download our Garden Note on bulbs (PDF). 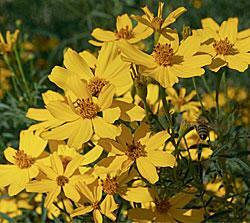 November is also a good time to plant California native annual seeds such as poppies. California poppies benefit from a long fall/winter growing period that allows for strong root development ahead of the summer dry season. If happy, California poppies will aggressively reseed annually. In fact, all the lovely poppies in our garden came from one packet of seeds spread over 8 years ago. November garden tasks include turning off the irrigation after checking the lines for leaks, continuing to monitor for newly sprouting weeds and cleaning debris out of our dry creek beds to allow for the filtering of rain water into the ground. November is also the time we prune back the goldenrod, and green mound juniper and cut California fuchsia to the ground. Come check out the garden. In addition to the plants, pathways, patios, raised planters, drip irrigation, a dry creek bed and permeable pavement demonstrate water wise, sustainable alternatives for gardeners who are considering replacing or reducing their lawns. lawns. 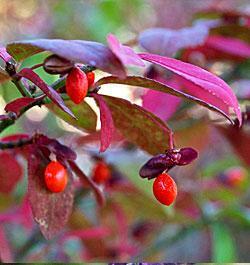 Winged euonymus (named for the winglike growths protruding from its stems) is a Northeast Asian native deciduous shrub which has been grown as an ornamental shrub in the United States since the 1860s. 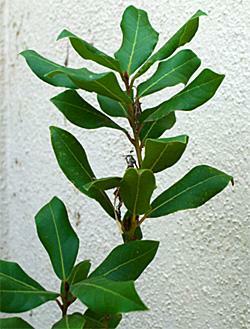 In some areas of the Eastern United States, it has escaped into woodlands and is considered an invasive plant. 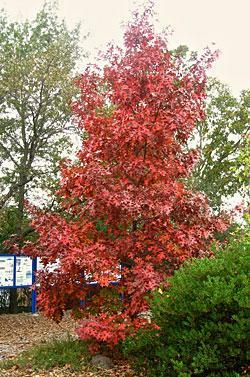 Widely planted east of the Rockies for brilliant red fall color, (which is why it is also called burning bush) as a hedge, specimen or foundation plant. Preferring well drained soil, it tolerates a variety of soils and exposures and hard pruning. Low maintenance and disease and pest free, with bright red berries that attract birds it can grow up to 20 feet tall and wide. Compact forms can grow to 9 feet high and wide and are recommended over the larger form for home gardens. A moderate water user, we have had no problems with the shrubs in the Fair Oaks garden where they receive some shade. Our shrubs are found both in the Mediterranean climate entrance garden and on the hill above the information sign in the lower perennial walk.